The generous giver who prefers to remain anonymous has struck again. This holiday season, he quietly went shopping at a local grocery store and a toy store, dropping $400 for children and families at Springfield Housing Authority’s Robinson Gardens Apartments. 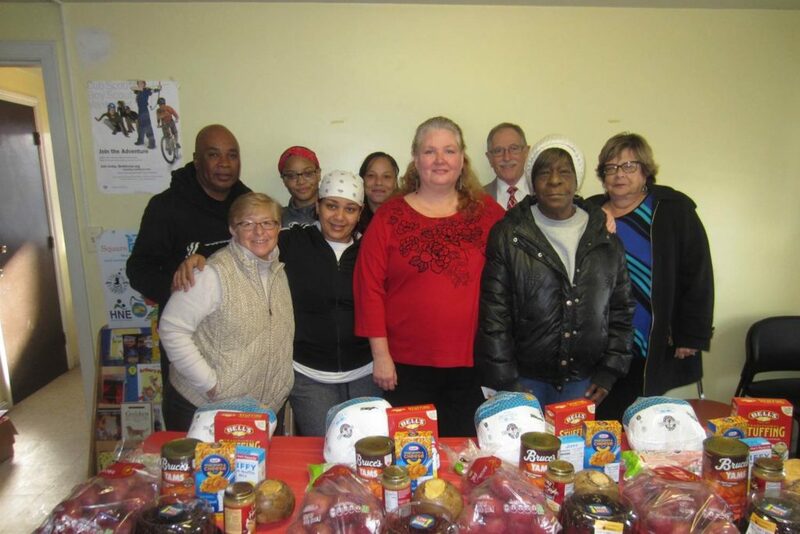 Left to right, Shamya Gates, Wanda Rodriguez, Isabel Cotto, Petra Menger and Joyce Brown at Robinson Gardens Apartments with the fixing for holiday meals donated by a generous benefactor. Then, just as quietly, Santino Tomassini headed out, leaving staff members Jimmie Mitchell and Lynne Cimino to divvy up the goods to several needy families, just in time for Christmas morning. 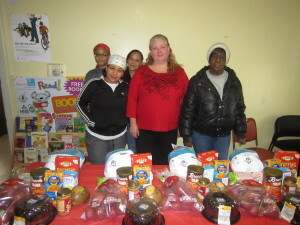 Families agreed they were thrilled to have a tasty meal, along with fun gifts to wrap and distribute. “This is very helpful,” said Joyce Brown, who lives with her son and a granddaughter, and was not going to be able to afford a fancy holiday meal but for Tomassini’s largesse. “I couldn’t ask for anything more. We’re very, very grateful,” she added. Tomassini, a shareholder at St. James Check Cashing took up the Robinson Gardens Youth Group as a cause five years ago, and has since expanded to helping as many families as possible from the public housing development in the Pine Point neighborhood of the city. Robinson Gardens residents with SHA staffers Jimmie Mitchell, youth engagement officer, Lynne Cimino, Talk/Read/Succeed! outreach coordinator, and William Abrashkin, executive director. Typically, he donates resources, whether it be buying bunk beds for one family, or funding a Youth Group field trip for the teens, with as little fanfare as possible. This holiday donation of meals and toys was no exception. 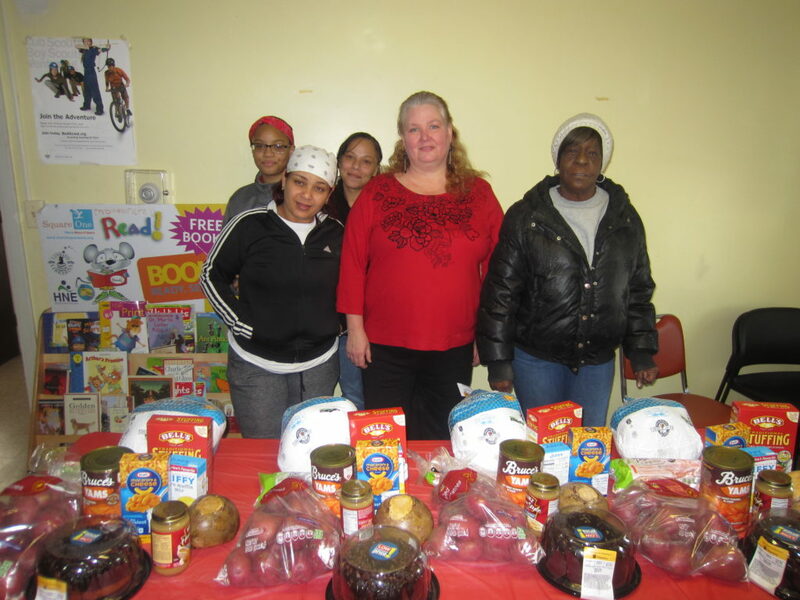 Tomassini’s efforts provided four families with complete holiday dinners of turkey, stuffing, potatoes, carrots, yams, muffins and cake. Another six families toys and games specific to the ages and genders of their children. Families were chosen by need, and then by lottery. Tomassini said he first learned of Mitchell’s work with youth when he read a newspaper article about the Farris Mitchell Scholarship, funded by the SHA, named after Mitchell’s father, and run by a committee that includes Mitchell and two others. Every spring, two SHA public housing or rental subsidy residents each receive $1,000 to help offset expenses during their first year of college. For Tomassini, learning about the scholarship made him determined to do his own part in helping youth people in the city, and he zeroed in on the Robinson Gardens Youth Group that Mitchell runs. 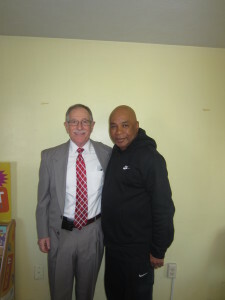 Springfield Housing Authority Executive Director William Abrashkin with Youth Engagement Coordinator Jimmie Mitchell, at Robinson Gardens Apartments. 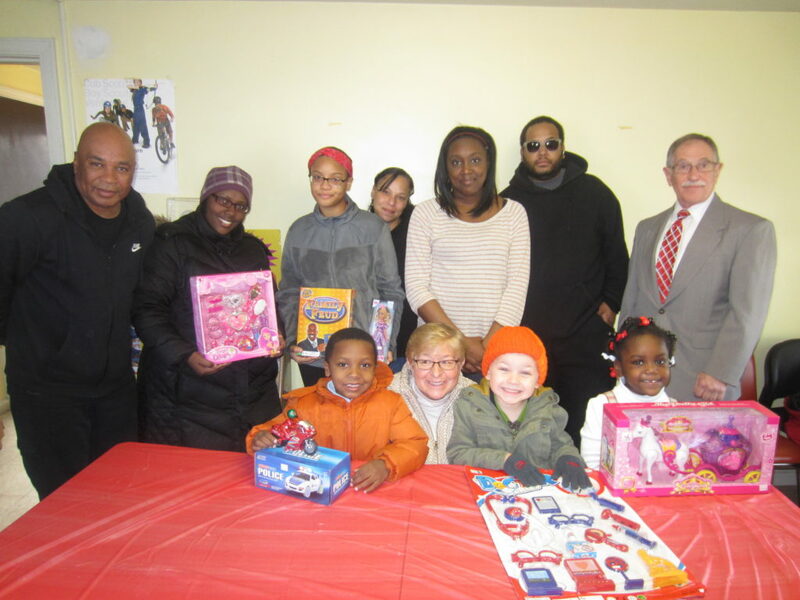 SHA Executive Director William Abrashkin attended the giveaway at the development, and praised the generosity of the man who asks for nothing back, not even recognition. Indeed, resident like Petra Menger said her holiday meal would have been nothing special had she not been chosen for the meal fixings. Isabel Cotto came by with her daughter, Shamya Gates, to pick up the food. “This is so helpful. I’ve had no income for awhile now, so I didn’t really know what I was going to do. This is a blessing,” said Cotto, who has four children. Shanna Scott and her daughter Genesis Epps picked up a bagful of toys for the holiday morning. Scott said the gifts mean everything to her family. “I’m not working right now, so I don’t have anything extra. We weren’t going to have much. Now, everyone will be happy,” Scott said. Mitchell, who meets with about two dozen Robinson Gardens teens every weekday afternoon, focusing on academics, jobs and future plans, said Tomassini has made a real difference with his gifts and generosity. “He’s buying and giving things that we need, but he’s doing so much more than that,” said Mitchell, himself a product of SHA public housing who went on to college, and to a career as a high school counselor before retiring to work with Robinson Gardens youth. “He’s showing our youth how to give back. That’s what the holidays are all about, and we can all see Mr. Tomassini participating in that in such a good way,” Mitchell said.